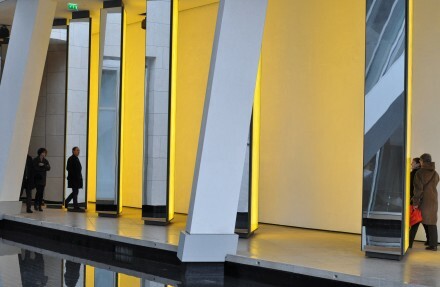 Olafur Eliasson’s monographic exhibition Contact has been specifically imagined for the newly opened Fondation Louis Vuitton. 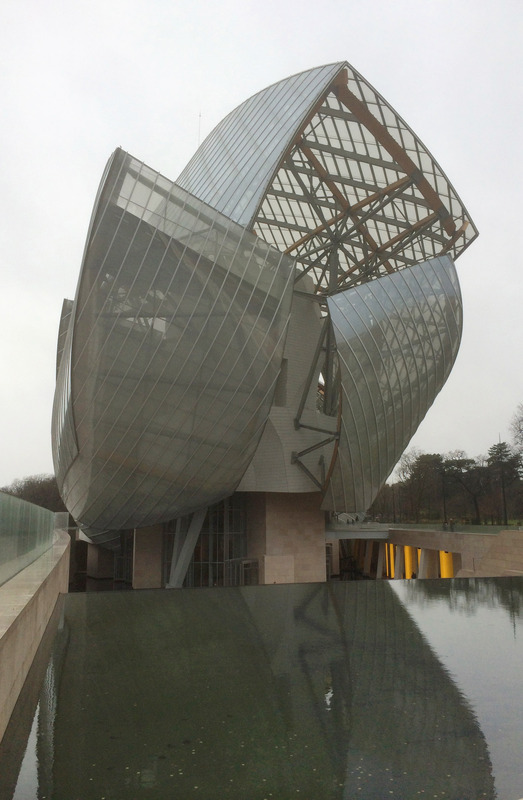 This majestic museum commissioned by Bernard Arnault to American architect Frank Gehry is a vessel for contemporary art located in the Bois de Boulogne on the west side of Paris. The building is composed by twelve immense glass “sails”, which shed natural light throughout its high volumes. 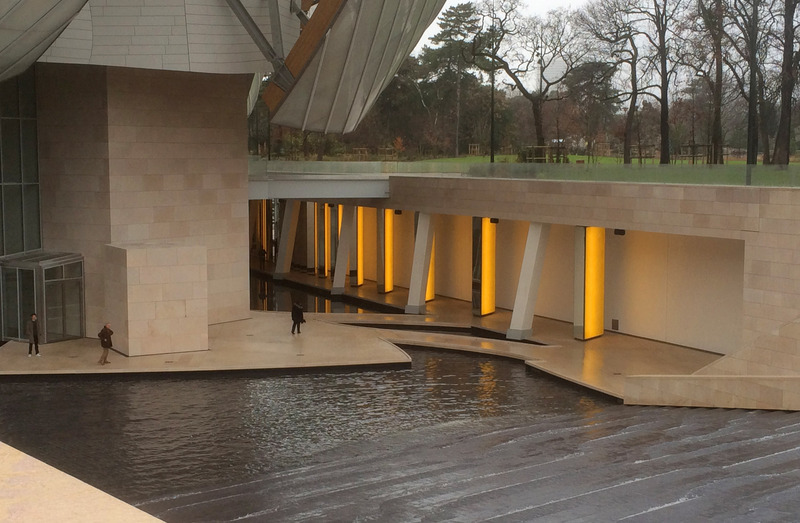 Outside, water cascades down a grand staircase and surrounds the lower level. On the rooftop multiple terraces offer another perspective on the architectural masterpiece as well as a striking overview of the park and the city. This interplay, between interior and exterior, structural and organic, light and depth is at the core of Gehry’s signature. Contact embraces the inherent principles of this architecture and its emphasis on natural elements. 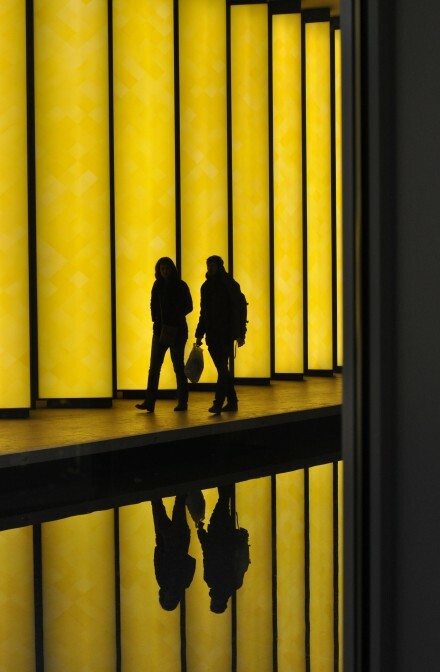 The novel works imagined by Olafur Eliasson however transcend the physical, optical and spatial phenomenon they derive from. Imagined as a progressive “space odyssey”, the exhibition has to be approached as a whole, in which the pieces address together the concepts of future, depth, infinity and question successively and simultaneously our very own position therein. 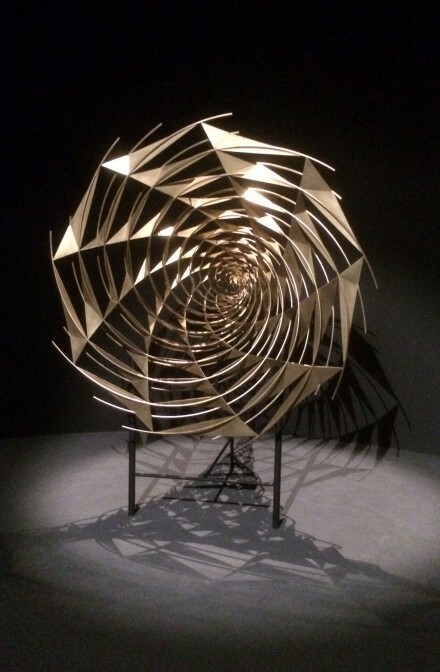 In line with the artist’s ongoing experimental research, these recent works thus pursue his quest in the dematerialization of the artwork and its dissolution in a perceptual experience. 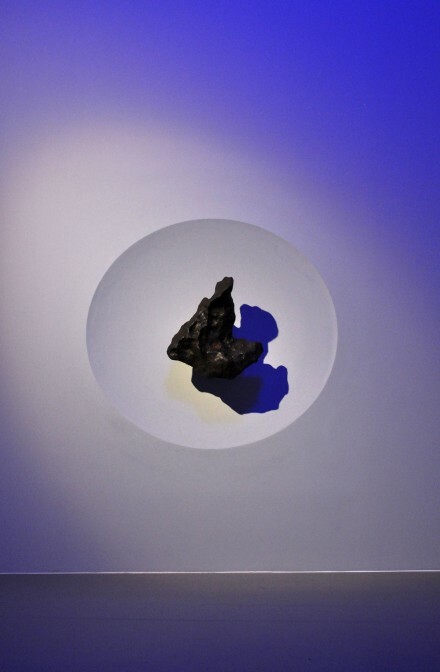 At the beginning of the journey, a meteorite is beautifully lit in blue and purple and bears the equivoque title Touch. The public is indeed invited to literally touch this piece of interstellar debris, which broke through our atmosphere and hit the ground of Siberia in 1947. 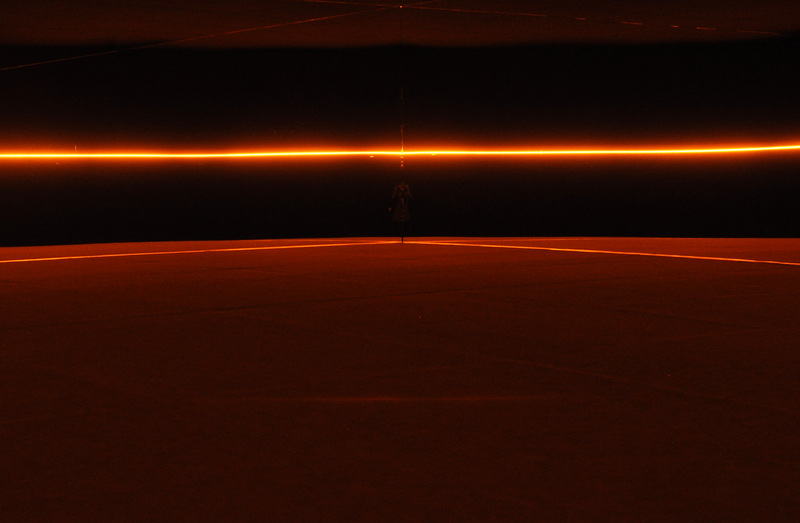 Transitory areas of darkness, where walls, floor and ceiling are covered with abrasive black sandpaper, punctuate the exploration and provide moments to pause and understand the shift operating in our senses. 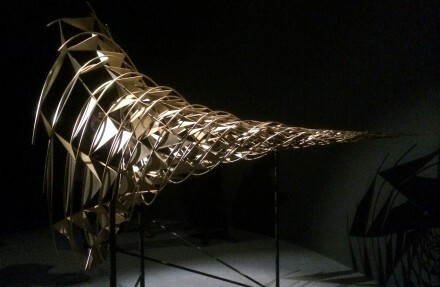 A series of optical devices are placed in sinuous passageways, offering to the public a distorted point of view on the existing outside world. Parallax planet and Double infinity are similar to oversized lenses, which set in motion the architecture and expose its visitors upside down. 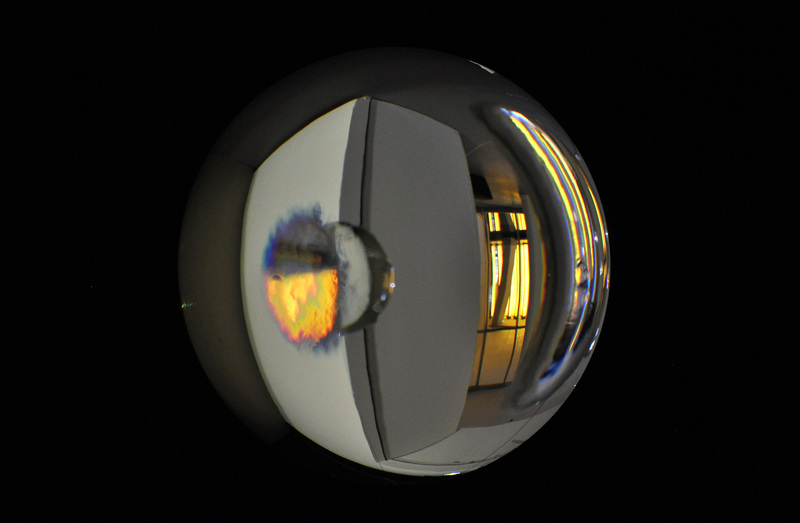 Eliasson thus succeeds in creating his own universe, constructed upon a new system defined by the spherical and the celestial, where gravity seems reversed, space can be stretched and time is suspended. The two large-scale immersive installations Map for unthought thoughts and Contact derive from the geometry of a circle and its inherent spirituality. They are multisensory environments in which the viewer is drawn in and becomes an active participant. 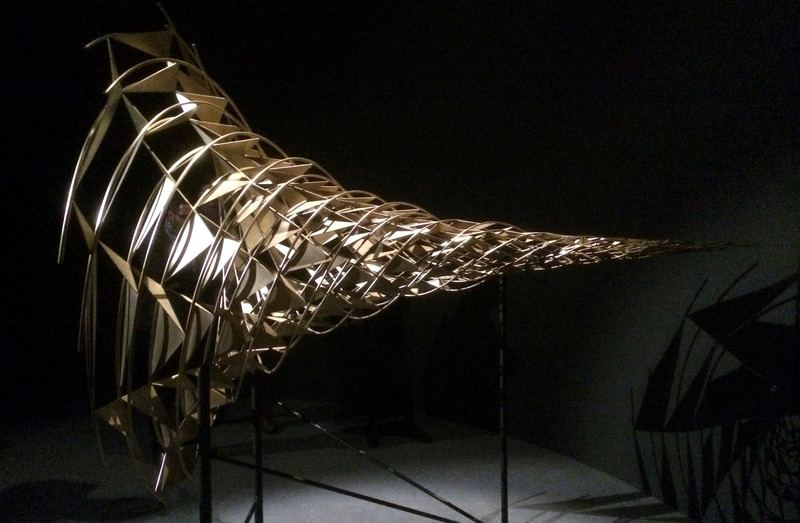 Map for unthought thoughts is a kinesthetic dispositive. 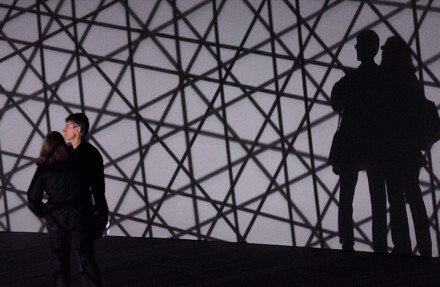 A dense grid of shadows is projected on the curved surfaces. 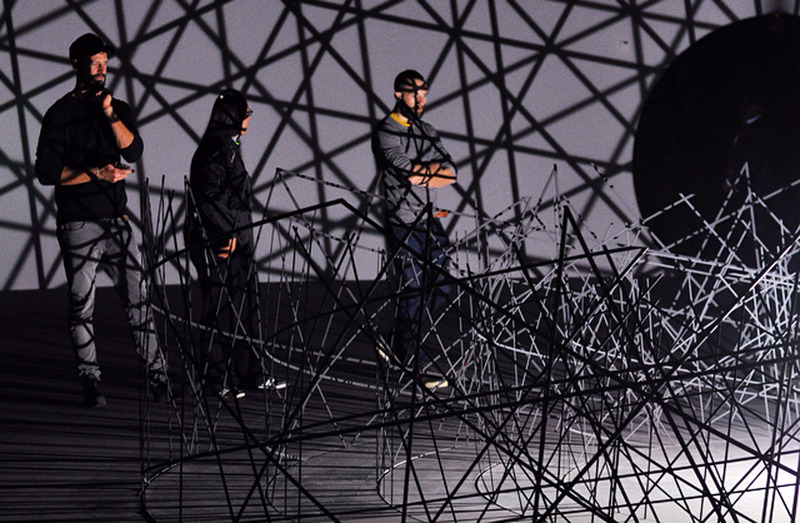 One long mirrored wall gives the illusion of a full circular room, disrupting the boarder between real and virtual. 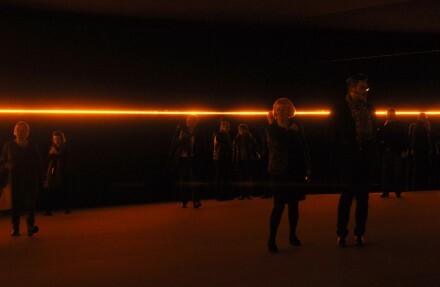 With the rotation of a sole light in the center of the installation, the crossed lines, along with the silhouettes of the visitors, expand and diminish in an ongoing cycle. 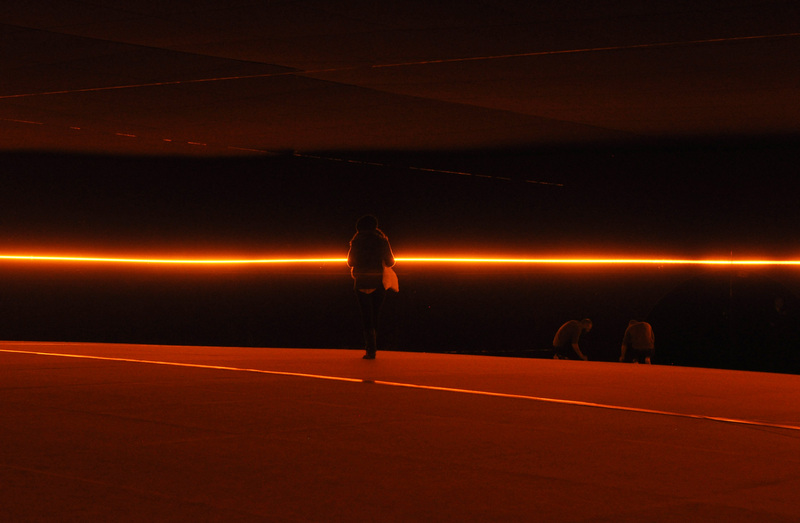 The contemplative Contact (the name from which the entire exhibition is drawn) on the other hand stages an infinite irradiant horizon. 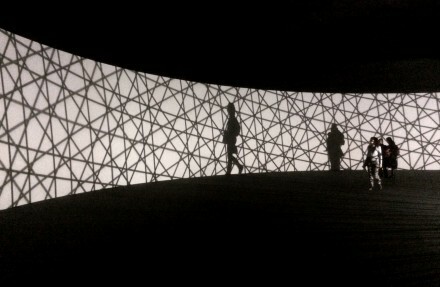 The viewer walks up a domed floor, evoking the top of a planet. Thanks to the perpendicular disposition of the mirrored walls, the line becomes a space, the quadrant becomes a circle, and one’s reflection is multiplied three times. 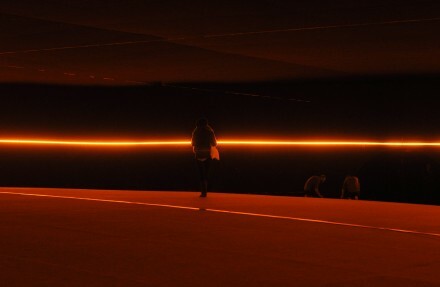 This meditative place, both seemingly infinite and enclosed, embodies Michel Foucault’s concept of “heterotopias” where : “the mirror is, after all, a utopia, because it is a place without a place” (Des espaces autres. Hétérotopies. 1984). 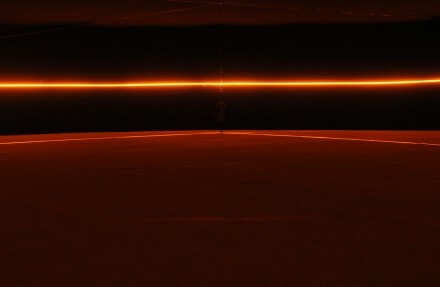 One of the final elements in Eliasson’s cosmic cartography is the sculptural Bridge from the future. It represents a metaphorical vortex for acceleration and could be viewed as a static and mathematical model of a black hole. 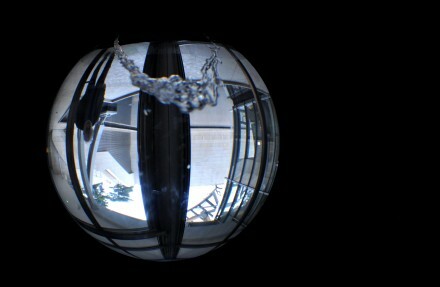 Finally the stroboscopic Big bang fountain ends the journey as a paradoxical return to its inception. 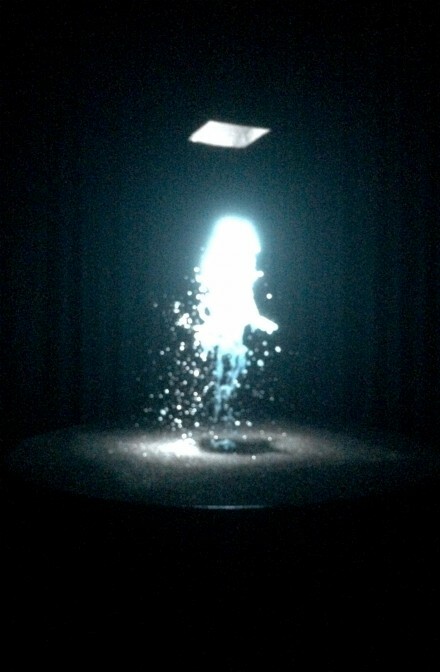 A flash of light freezes, just for an instant, a violent stream of water, and crystallizes it, during this very instant, in a fragile and ghostly vision. Contact is on view at Fondation Louis Vuitton, Paris through February 16th. Two other site-specific works by Olafur Eliasson remain permanent. 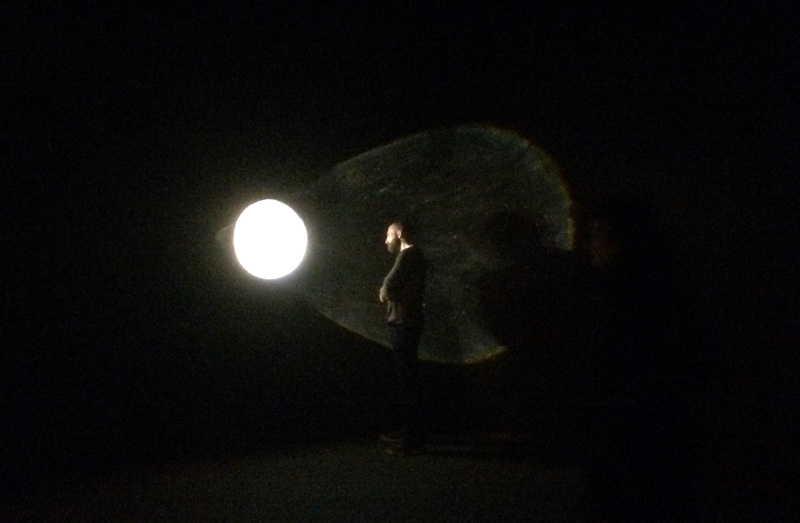 A monumental installation, Inside the Horizon, is on view in the Grotto. 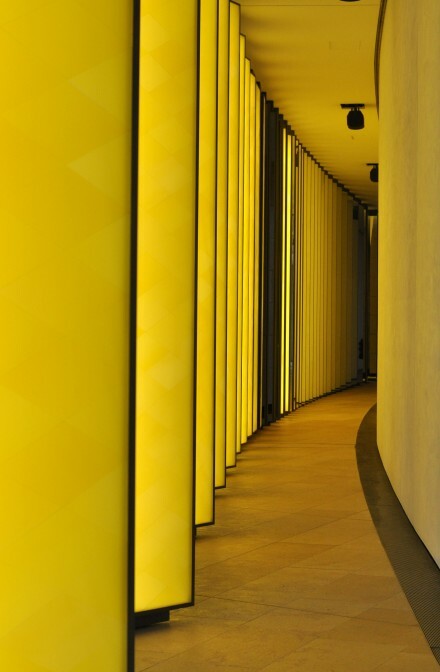 Composed by 43 yellow columns of light and mirror, this giant kaleidoscope entices, in echo to the show, our mechanisms of perception and interaction. 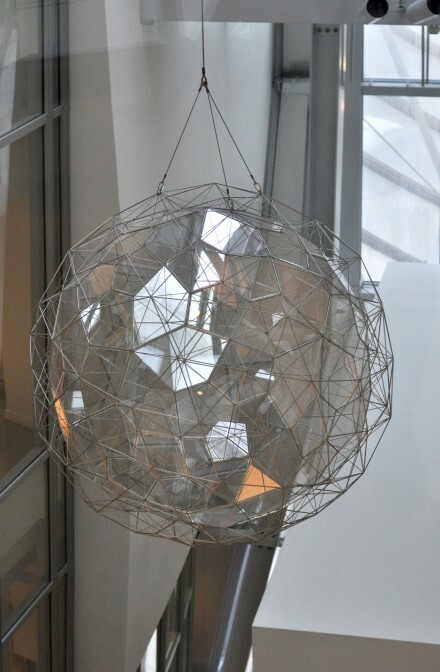 Dust Particle, which hangs in the heart of the building is also part of the permanent collection. 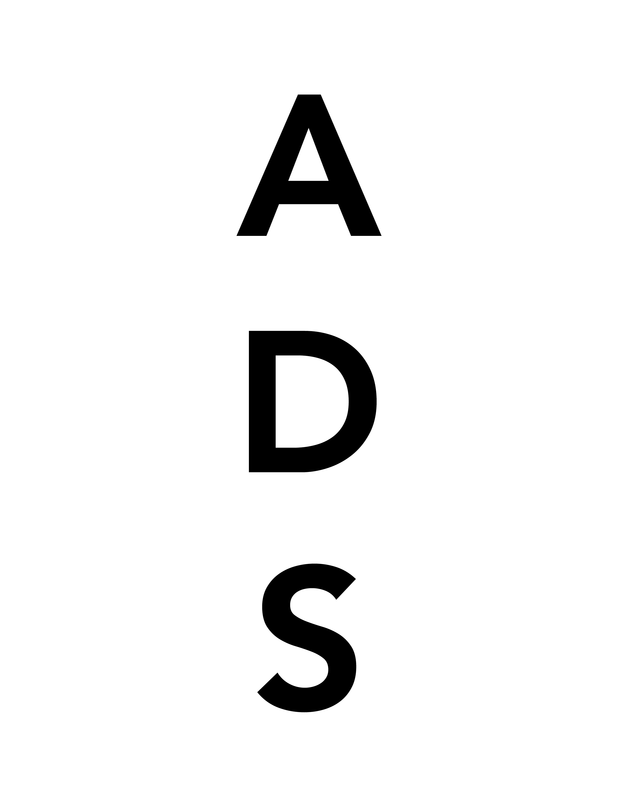 This entry was posted on Thursday, January 8th, 2015 at 11:48 pm	and is filed under Art News. You can follow any responses to this entry through the RSS 2.0 feed. You can leave a response, or trackback from your own site.